Malvan is the emerging star of Maharashtra’s tourism and its major assets are its huge coastal line, incredible serene beaches and its nearness to Goa the popular beach destination of India. The credit of attracting tourists to Malvan goes to its exotic beaches like Chivla beach, Tarkarli beach, Devbag, Malvan beach, Vengurla and kolamb beach. Tarkarli is a village in Sindhudurg district and the well known tourist destination of coastal Maharashtra. The most popular Sindhudurg fort is visible from this place. Ramnavami festival is celebrated with great enthusiasm in this seaside village. Tarkarli beach is located just eight km from Malvan the major city of Sindhudurg at the confluence of the Karli river and Arabian sea. The river banks are wide enough lined with tall suru trees and fishing boats lined on the long stretch look really awesome. Tourism department of Maharashtra has devoted more attention on the uplift of this beach to turn it into a most favoured destination in Konkan. The beach has a cottage resort erected by MTDC. At around six km from the beach is the Tarkarli creek which is the best place for invigorating adventure activities and water sports like water scooter riding, boating, scuba diving and snorkeling sponsored by the tourism department. The waters of the beach are crystal clear with best visibility up to twenty feet suitable for underwater activities. Due to the proximity of the Arabian Sea chances of sighting Dolphins are more. The beach is safe for swimming and best for strolling around. 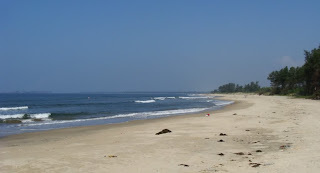 The beach is accessible by road from Malvan by bus and rickshaw. By train it can be reached by Konkan railway from Kankavli station. The best combination of sea, sun and sand backed by scenic views adds to the beauty of this beach. The MTDC cottages near the beach provide luxurious but affordable means of stay with many recreational facilities. Budget hotels near tarkarli beach are another option of staying at the beach. Houseboats introduced by tourism department are the most popular among the tourists visiting this beach. They are fully equipped Luxury boats with most modern amenities made available on them. The best time to visit this incredible beach is from October to March since the temperatures during this time are most favourable for snorkeling and scuba diving. For comparatively cheaper deals visit the beach during summers. Hotels in Malvan are the best to taste the delectable seafood varieties. Our Hotel Sagar Kinara in Malvan is the best place to spend your vacation and get the taste of the most popular Malvani dishes.